Make Your Nursery Lighting Shine. Info on Planning and Decorating, Types of Nursery Lights, and Making Your Own Baby Lighting Decor. Choosing the lighting for your baby nursery is a more complicated task than it would first appear - do you know how many different types of baby lamps there are available today? My top planning tip is to make sure you think about your nursery lights early in the baby nursery design process. Baby lights may not seem that important when you're in the midst of decisions about baby cribs and changing tables, but if you need to run extra wiring for wall lamps or additional sockets you'll want hubby to pull out the angle grinder BEFORE you create your perfect nursery wall design. You also need to decide on where you will need the most light, what type of baby lighting you want and as always infant safety must be taken into consideration. 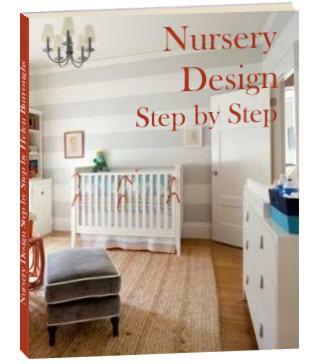 For everything you need to know about planning your baby nursery lighting, click here. The ambient light provided by nursery chandeliers brightens the whole baby room. 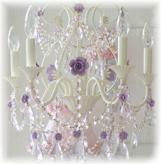 Nursery chandeliers come in numerous enchanting styles to match almost any baby nursery design. Baby lamps provide area lighting for specific tasks such as feeding and diaper changing. You will want to shed light on a small area without flooding the entire room. The idea is to keep baby in a sleepy state! 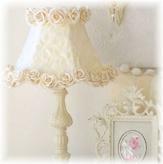 Baby lamps are cute and add a finishing touch to your baby nursery design. You can also provide area lighting with directable wall sconces or nursery floor lamps. The right lighting is essential for moving around the baby nursery at night without waking your sleeping baby and without stubbing your toes. You don't want a quick check up on your cuddly bundle to turn into a mid-night greeting! The safest and most effective way to achieve soft illuminating baby room lighting is to make use of a dimmer switch. I have one in Sarah's room (my 4th baby) and I wish I'd thought of it for the nursery rooms of my other three. You can't beat it for functionality and convenience. Of course, nursery night lights are the other option here. These are available in many forms including lamps, wall units and light shows with music. Important infant safety issues to take into account when planning your baby lighting. Think ahead - one day soon you'll be dealing with a troublesome toddler, not an innocent, bouncy baby. By the time you get around to buying lighting fixtures, your baby room budget will probably be straining at the seams. But don't worry - there are several ways to save money on baby lighting if you need to. If you are decorating your nursery with a theme browse through our theme stores to find the perfect nursery room lighting to match! If you're feeling creative, making new baby lighting from old is a great way to save a few bucks on that ever dwindling baby nursery budget. Beyond that it's loads of fun and you have the satisfaction of knowing that you've added your own unique touch to your baby's special place. Revamp an old lamp shade. You can do this by recovering it, painting it with fabric paint, stenciling a design or decorating it with frills and fabric cutouts. This is a good option if you've made your own baby bedding - you can use the same fabric to make a matching lamp. Bring new life to an old or plain wooden lamp stand by painting it to match your nursery decor. Jazz up an ordinary looking kids ceiling fan with paints and stickers. And that's about it! So what are you waiting for? Have fun brightening your baby's night with beautiful nursery lighting.